Preheat oven to 400 degrees. Line a baking sheet with foil. Evenly space potatoes on baking sheet. Bake potatoes for 18 to 20 minutes or until crisp and lightly browned. Remove from oven. Adjust oven racks and preheat broiler. Meanwhile, in a medium bowl combine meat and seasoning. Form into sixteen 1-ounce mini burgers (about 2 tablespoons). In a 12-inch skillet cook burgers, uncovered, over medium-high heat, turning burgers once half-way through cooking. 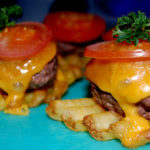 Top each potato with a burger, cheese quarter, and tomato slice. Broil 4 to 5 inches from heat for 1 to 2 minutes or until cheese is melted and tomato begins to brown. Serve with mustard, ketchup, sour cream, and/or pickles. Makes 16 snacks.